We'd like to hear detailed descriptions of problems viewing videos in standalone players and browsers. HTML5 and WebM especially are very new, and it's highly unlikely the experience in any browser is going to be free of hiccups quite yet. The more feedback we get about what doesn't work, the more we can do to make sure problems get fixed. A list of Ogg Theora players (without troubleshooting or discussion) with links to vendor pages can be found on the Theora Software Players page. There are two basic ways of changing the video currently playing back in the current HTML5 spec, and both have some practical problems we'd like to see fixed before the spec is finalized. The second option is to switch the pre-existing video element to a new stream. This is much faster as the original stream stops sinking bandwidth immediately, but upon loading it always starts from the beginning and in current browsers also displays the first frame, even if playback isn't started. After the load completes, then it's possible to seek forward to where the original stream started. It doesn't look as good, but it's much faster in practice. Xiph's video playback scripting uses the second, faster option, so there's a brief flash back to the beginning of the video upon resolution switch. The 'extra controls' that appear as a bar along the top of the video playback window are implemented using HTML5 <video> tag features, and as such can't work as written in browsers using the Cortado fallback applet. Cortado does support subtitles via the 'CC' button in the lower right of the playback area, and our Ogg streams include subtitle tracks. Unfortunate combinations of website and browser can result in Cortado playing the media independently in parallel with the browser's native playback. Two instances of the soundtrack plays concurrently, resulting in echo. One soundtrack is in sync with the video, e.g. stops/restarts in sync with the video. The other is uncontrollable. The media controls are the browser's native. Any evidence of Cortado are unseen. Disabling Java fixes the problem. Firefox before version 3.5 (or 3.1 beta) did not include native support for Ogg or WebM. 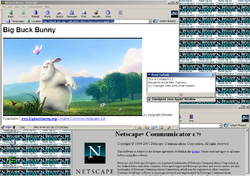 These browsers can play Ogg video via the Cortado applet if a Java runtime environment is installed. With Java installed, playback is seamless but does not have a full set of HTML5 features; resolution switching and chapter navigation are disabled. Cortado has native support for Ogg Kate subtitles. Firefox 3.5 was the first version of Firefox to ship with native Ogg playback. It features a full HTML5 feature set, though it is known to be relatively slow about seeking and navigation. Seeking may work poorly if your connectivity to the media passes through a proxy which strips HTTP range requests. On common GNU/Linux systems with pulseaudio, such as Ubuntu and Fedora, playback will halt and refuse to continue after pausing (and potentially seeking) and will not continue unless the page is completely reloaded due to Mozilla Bug#526411. Firefox can play "isolated" video files from local storage too, if the file has proper extension. Both ".OGG" and ".OGV" are accepted, since 4.0 also ".WEBM", but for example ".WEB" will not work. Firefox 3.6 behaves similarly to FF3.5, but adds poster support and more robust Ogg stream navigation along with some bug fixes. Seems to pass all tests (not sure about the 322x242 "not divisible by 16" - there is a black line ...). High requirements to play (especially large) videos, behaves badly if hardware is insufficient to play in real-time. Watching the clip in 480p quality works fine when watching from the very beginning, but when seeking to an unloaded scene, playback is very poor (Firefox 3.6.13, Windows XP Pro, 2.59 GHz CPU, 1.75 GB Ram here). Workaround: Pause the video and wait for a few seconds until pressing play again. Firefox 4.0 features a new Ogg playback engine that allows considerably faster stream navigation, as well as WebM support. I watched half of the video with french subtitle perfectly. I had to pause. The day after I was unable to restart the video from where I paused. The movie were reloaded 4 times and I had the circle turning endlessely. I had to switch to 480 resolution to have the movie played again at the specific time I wanted. Hope this help. Google Chrome added Ogg playback support in version [? ], but it known to have serious bugs when seeking in Ogg streams; it also tends to lose the beginning of videos. Recent releases of Chrome support WebM, which works considerably better, though the playback framerate is often choppy/jerky (at least on Linux). The "Save Video As" menu item re-downloads the video, even if it's fully cached. Internet Explorer through version 8 has no support whatsoever for Ogg, WebM or the video tag. Normal installs do include Java support, however, so these browsers are able to play Ogg video through the Cortado applet. With Cortado, playback is seamless but does not have a full set of HTML5 features; resolution switching and chapter navigation are disabled. Cortado has native support for Ogg Kate subtitles. Internet Explorer 9 (currently in alpha/beta) apparently at least somewhat supports the HTML 5 video tag, however it does not support Ogg or WebM playback out of the box. Microsoft has stated it will support Ogg and WebM 'if the codecs are installed on the system'. Presumably having the Open Codecs pack installed fufills this requirement and enables Ogg and WebM support (confirmation would be appreciated! If you have the Open Codecs Directshow filters installed, you should get full in-browser playback). Konqueror has native playback of HTML 5 audio/video. It supports all formats supported by Phonon, which supports all formats supported by its backend. Available Phonon backends include Xine and Gstreamer; backends using VLC and Mplayer are worked on. Using Xine as Phonon backend crashes Konqueror upon webm playback. (see KDE bugreport). Use Gstreamer instead. Laugh if you must, but Navigator back to version 4 can play Ogg video via the Cortado applet. Opera released an experimental Ogg Theora enabled build in 2007 as the very earliest attempt to support video in a browser ever, official HTML5 video support since 10.50 (Theora only, hangs on some systems), since 10.60 problem is fixed and additionally WeBM is supported. Theora offset almost correct (example: tiny green stripe at frame bottom, other mirror: ). Safari does not ship native support for Ogg or WebM video, however all versions can play Ogg video via the Cortado applet. With Cortado, playback is seamless but does not have a full set of HTML5 features; resolution switching and chapter navigation are disabled. Cortado has native support for Ogg Kate subtitles. As of Safari 3.1, Safari supports full HTML5 Ogg video playback via the XiphQT Quicktime Components. Theora decoder seems fully compliant, but no sound yet, seeking / timing is bad. As of release 0.6 (obsolete, 0.10 is out), ffmpeg supports WebM playback, and Ogg playback is solid with the exception of surround support (eg 5.1 and other surround encodings produced my modern Vorbis encoders will not play). Prior to ffmpeg 0.6, WebM was not supported and Ogg video playback was broken due to a number of longstanding bugs caused by treating Theora as if it was just VP3 (eg, the 'sheet lightning acid trip' bug that caused the image to disintegrate into a shower of colored blocks). Many applications and video sharing sites (such as YouTube) are still using old versions of ffmpeg internally, and as such, they cannot handle Ogg video unless it is encoded in 'vp3 compatibility mode'. Recent Mplayer versions have good native Ogg Theora playback support through libavcodec and since cca 2010-07 can additionally handle WebM playback through libavcodec too (ffmpeg libraries). OGG Dirac is not supported. Mplayer has had a number of minor Ogg playback bugs in the past that mostly caused seeking or smoothness hiccups. Recent versions should have fixed all of the playback/seeking bugs of note. OGG and Theora support has been inferior for years (but mostly worked with encoders from given era), improved at beginning of 2010, a regression existed from 2010-06 to 2010-09 (mirrored / messy top 16 lines, "nan:1" complaints, BUG#1788 BUG#1774 BUG#1771), now fixed. Quicktime supports Ogg and WebM playback and encoding through the XiphQT Quicktime Components. These components also add Ogg support to Quicktime-aware applications such as Final Cut and Final Cut Pro. Totem supports Ogg and WebM playback via native support in gstreamer. VLC has had good native Ogg Theora support since the GoldenEye (1.0.0) release, Theora and Vorbis decoder seems fully compliant. Ogg/Dirac is supported. WebM support is available since 1.1.0. Ogg/Opus support is available since 2.0.4. Past releases had tiny problems specific to some videos or systems (fixed in 1.1.4), OGG file duration is frequently reported badly or not at all, that problem can be reproduced with Theora videos (example) but also with plain OGG/Vorbis files (example). (fixed in 2.0.4) Problems with insufficient CPU performance with Ogg/Dirac have been fixed in (2.0.0). Some webm files don't play correctly (samples?). WMP supports Ogg and WebM playback through the Open Codecs DirectShow filter pack. This page was last edited on 8 September 2012, at 09:25.